You know we love to collaborate with our friends who dedicate themselves to feeding people well. So…this is a fun announcement! Starting this Friday, December 8, you’ll be able to order one of our favorite recipes from our second cookbook, The Chubby Vegetarian: 100 Inspired Vegetable Recipes for the Modern Table (Susan Schadt Press, 2016). 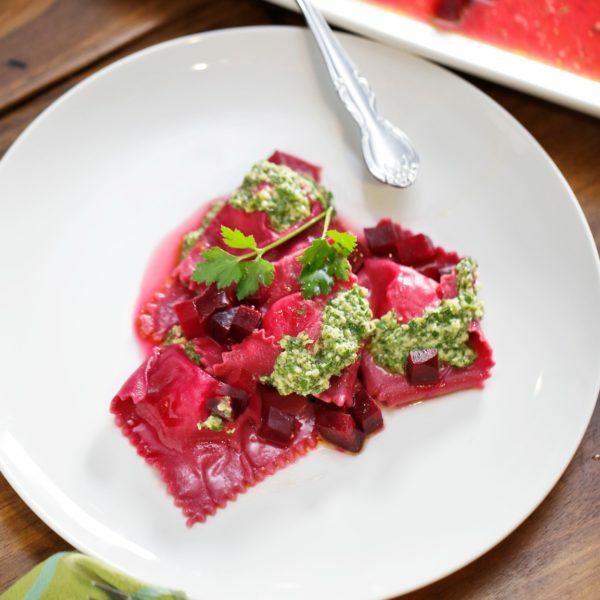 Our Beet and Goat Cheese Ravioli with Parsley and Mint Pesto will be available (while supplies last) at the Libro at Laurelwood restaurant located inside of the new Novel. bookstore on Perkins south of Poplar in Memphis. It’ll be served for only a week, so get to it by December 15, the last day it’ll be highlighted on the menu there. It’s one of the recipes from The Chubby Vegetarian cookbook that we still make quite often because of the shocking magenta and emerald green presentation on the plate, and, well, it’s also pretty delicious. If you get a chance to try it, please let us know what you think about our dish. For pairing with the ravioli, owner Sabine Bachmann looked over her wine list for us and recommends you try “Le Monde Pinot Grigio from Friuli or Fantini Sangiovese for the red wine lovers.” Sounds like date night or girls’ night or some other kind of super fun night to us. Hope to see you soon at Libro.